The goal is simple: Ensure everyone has access to safe, nutritious and sufficient food by 2030. Population growth, water shortages, climate change and increasingly infertile land mean sustainable agriculture will be vital to feeding the world in the not-to-distant future. By 2050, it is predicted that the global agricultural sector will need to produce 70 percent more food to feed the world’s projected 9 billion people. However, the available arable land capable of supporting food production is declining every year, placing greater pressure on ensuring global food production keeps pace with population growth. Indoor farming techniques and other innovations such as land-based recirculating aquaculture systems and alternatives to traditional animal proteins are gaining traction in the United States and abroad in an effort to offset the projected food deficit while mitigating many of the environmental impacts typically associated with large-scale agriculture. But a crucial challenge still persists: How can we help these agriculture innovators scale the infrastructure necessary to help meet the world’s food demand while maintaining cost competitiveness with conventionally grown produce and protein sources? Indoor farms require a complex integration of artificial lighting, climate control, power, water and digital control systems. The challenges related to scaling and deploying indoor farming infrastructure center around the management and cost of these resources. In the United States, a significant amount of produce is sourced from Mexico or California, both of which are located in water-stressed areas that are prone to droughts. In fact, California has only recently emerged from one of the worst droughts in the state’s history, lasting from late 2010 to early 2017. The economic impact of the drought has had far-reaching consequences. According to the University of California, Davis, the drought resulted in crop revenue losses of about $810 million in 2014 alone. Dramatic environmental conditions aside, the produce grown in California and Mexico for U.S. consumption is typically transported by road, traveling hundreds or even thousands of miles before landing on our plates. This results in significantly higher food waste and contributes to greenhouse gas emissions, which in turn could increase the chances of more severe droughts in the future. For many of the reasons listed above, indoor farming has become a buzz-worthy topic in the agtech field, drawing significant media attention and venture capital. For example, Japan has for several years looked to indoor farming to help improve agricultural production, owing to the lack of available arable land in the country. In the Netherlands the trend has been to focus on automated greenhouse production, which has resulted in some crops, such as tomatoes, being predominantly greenhouse grown for the last several decades. Controlled environment agriculture offers many significant benefits such as the ability to reduce food miles, water usage savings over traditional field-grown crops, the ability to grow year-round and elimination of pesticides and herbicides. This does not mean however that indoor farming is a silver bullet to solve all food production woes. 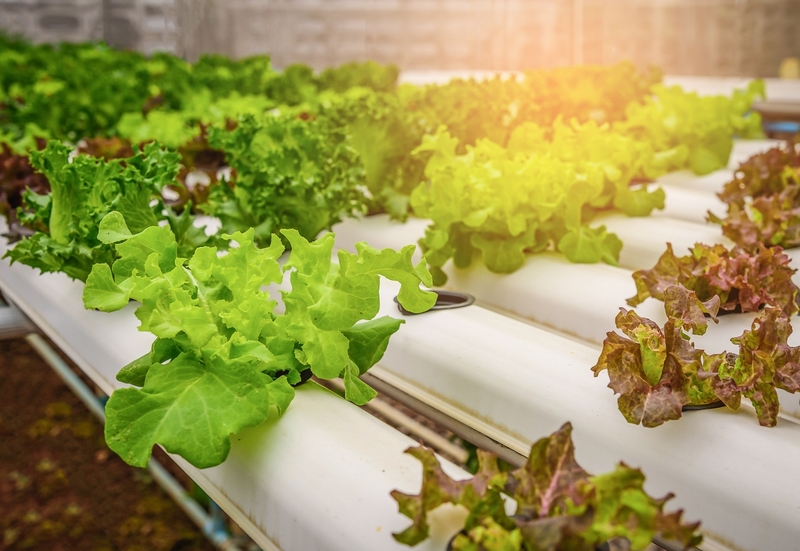 Black & Veatch has recognized that significant challenges can exist when trying to scale and deploy indoor farming infrastructure across the United States. Rising labor costs have put a new focus on automation solutions, and access to capital investment is a critical inhibitor associated with large-scale indoor farming. Key to managing costs in large-scale efforts will center on resource management, specifically energy consumption for LED lighting, climate control and hydroponic grow systems. Rather than harnessing free energy from the sun, indoor farms are reliant on artificial lighting primarily from LEDs. While LED cost and performance are improving, lighting is still a significant cost, both in initial capital cost and ongoing operational cost. Another energy consumption challenge is climate control. Climate control systems must be designed to remove the heat rejected from LED lights as well as the humidity generated from transpiration of plants. In densely packed indoor farms, these climate control systems can quickly become complex and costly. An estimated 80 percent of fish consumed in the United States is imported from areas such as Asia, Norway and Chile. Additionally, natural fish stocks are being fished at maximum capacity. Ocean pen rearing in the United States is very limited and as a result, the country imports a number of ocean species, most notably salmon and shrimp. Recirculating aquaculture systems are large, controlled environment fish farms utilizing treatment equipment to recirculate water and provide an optimal environment for raising different species of fish. These systems are advantageous because they provide an alternative production method that prevents the need to use antibiotics in the fish rearing process and properly treats the fish waste prior to water being introduced back into the environment. Furthermore, recirculating aquaculture allows fish to be produced closer to the point of consumption, dramatically reducing transportation costs and could be leveraged to make the U.S. a net exporter of fish products. However, recirculating aquaculture systems do have their drawbacks, led by capital expense costs, along with maintaining ideal environmental/water quality conditions for the specific fish species and ensuring efficient system designs. Global meat production is expected to grow 16 percent by 2025, according to the Food and Agriculture Organization of the United Nations. Meat consumption in the United States is expected to reach record highs this year, with the U.S. Department of Agriculture predicting production to break through the 100-billion-pound mark for the first time in the country’s history. Meat production is clearly on the rise and traditional livestock rearing requires substantial resources. In fact, an average of at least six pounds of feed is required to produce a single pound of beef, putting additional pressure on production for feed crops. Alternative protein production methods will need to be developed to supplement the growing population’s demand for meat, and they have the added benefit of driving sustainability in the food chain. Cellular agriculture is the process of replicating animal cells at a cellular level in a controlled environment. At scale, large bioreactors will be utilized to create a controlled environment for cell replication, which could have significant implications for how we produce our protein products in the near future. Many of the biggest challenges faced by agtech innovators are rooted in scaling up from lab and pilot technology to commercial operation. Technology and infrastructure must be scaled correctly and cost-effectively to feed a growing global population. It will be crucial that agtech leaders focus on partners with engineering and construction knowledge and expertise to deploy and scale infrastructure efficiently and effectively. *Kim Lovan and Zack Olson are co-founders of NextGen Agriculture, a growth initiative at Black & Veatch focusing on leveraging the company’s global expertise in power, water and telecommunications to provide engineering and construction services to emerging technologies in the food production space.